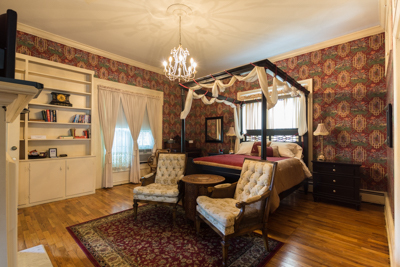 Nestled in a quiet Independence neighborhood, the Silver Heart Inn (816-838-9508, www.silverheartinn.com) is housed in a classic Greek Revival-style mansion. And although the inn just began operation in 2013, the house itself has a rich history. Originally constructed by Napoleon Stone in 1856, the home is built from hand-hewn walnut harvested from the property. At that time the house was located one mile outside the city limits, so it fortuitously survived the burnings set forth in General Order 11 that was issued during the Civil War. In subsequent years this Missouri gem changed hands many times, and it was even divided in two by one owner. Today the house that stands at 1114 South Noland Road is actually the rear wing and the side entrance of Stone’s original house. 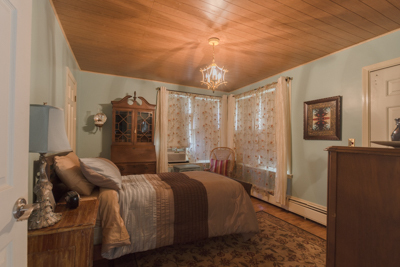 And since it has some features not found in most historic homes, Melanie and Perry Johnson were able to include an accessible guest room in the plans, when they converted this private residence to the Silver Heart Inn. There’s accessible parking in the back of the house, with level access down the driveway to the ramped back entrance. The four guest rooms are located on the second floor, with the two wings divided by a staircase. There is also a small elevator that runs from the first floor to the Roy Gamble Room on the second floor. The Shirley Gamble Room is located next door. The larger of the two rooms, it’s named for Roy Gamble’s second wife. It’s furnished with a 33-inch high queen-sized bed, with a step stool and wheelchair access on both sides. The spacious room also has two comfortable chairs and a table in front of a working fireplace. There’s good pathway access throughout the room, and although the decor exudes a definite Victorian charm, the Asian accents really ramp up the vibrancy. The bathroom, which was remodeled after Mr. Gamble had a stroke in the 1980s, is located next door to the Roy Gamble Room. It features a full five-foot turning radius and is equipped with a roll-in shower with a hand-held showerhead and a portable shower chair. The toilet, which is located next to the pedestal sink, has a unique grab bar configuration. There are standard grab bars on the back and left walls (as seated), and a floor mounted grab bar on the other side. 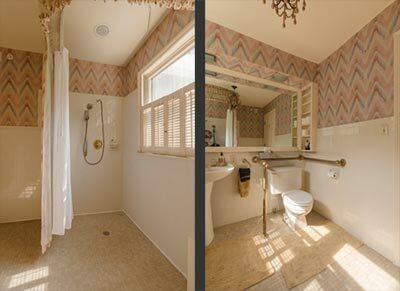 The floor mounted grab bar only extends halfway out from the back wall, so there is room for a side transfer, but it may be difficult for some folks. All in all the access features in the home will work for many people, but some folks might need a little extra assistance. Guests can just book the Shirley Gamble Room if they don’t need the extra bed, or rent out both rooms for a very spacious suite. And if you just reserve one room, Melanie will block the other so you will have a private bathroom. 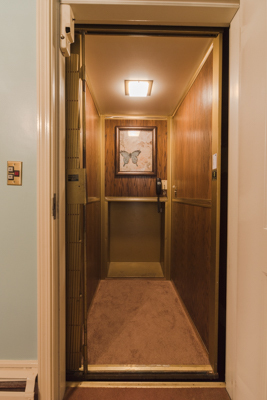 It’s also important to note that even though you have to walk out into a semi-private hallway to access the bathroom, there are no other guest rooms in that wing of the house. Melanie also serves up a tasty breakfast each morning in the Avanell and Roy Gamble Dining Room. Named for the former owner and his first wife, the spacious room features a level entry with plenty of room to maneuver a wheelchair. Melanie is known for her use of local foods and fresh ingredients, and she’s always adding new recipes to her repertoire. No matter what she whips up, you won’t be disappointed.